For the sauce, in a bowl add chili sauce, bbq sauce, brown sugar, onion salt, garlic salt, ketchup, mustard, and ½ cup water. Whisk to combine thoroughly, making sure that the sugar is completely dissolved. (If sauce is too thick, add remaining water.) Cover bowl with a sheet of plastic wrap and place in the refrigerator until ready to use. For the brisket, preheat oven to 225 degrees. In a shallow baking pan add brisket. Using a pastry brush, lightly coat Liquid Smoke over all sides. Place in oven and cook for 7 hours or overnight. (Brisket will turn very dark when done, so don’t worry.) Remove from oven and transfer brisket to a clean cutting board to cool. Raise the oven heat to 325 degrees. 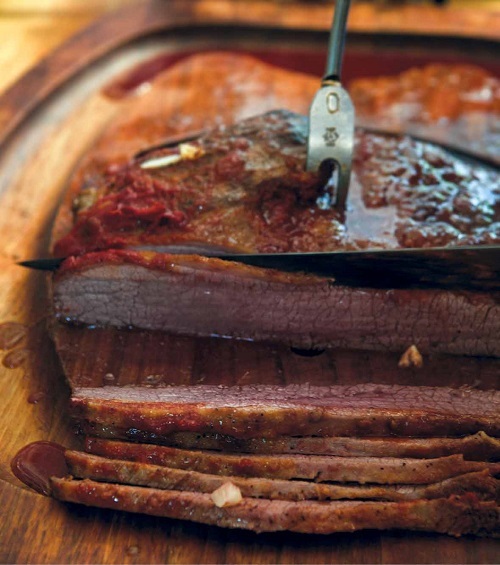 Using a large sharp knife, cut brisket into 1/8-inch slices. (It is important to cut slices against the grain of the beef.) Transfer slices by layering in an ovenproof casserole dish. Pour sauce over the top of meat. Tightly cover the pan with a sheet of aluminum foil (or casserole dish lid). Place in oven and bake for 30 minutes or until heated. Serve warm. Makes 12 to 18 servings. ETC: A great make-ahead dish. Just cover tightly and freeze when the recipe is completed. Thaw before warming. 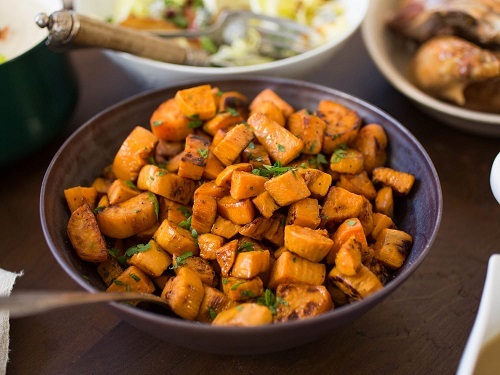 The trick to creamy and flavorful sweet potatoes with a slightly crisp, caramelized crust is par-cooking the potatoes. Then roast them in the oven for just under an hour for tender. Tossed in olive oil, parsley, and a bit of honey, they’re a crowd-pleasing side for any wintertime meal. Place sweet potatoes in a large saucepan and cover with water. Heat water to 160°F as registered on an instant read thermometer. Cover and set aside for 1 hour. Meanwhile, adjust oven racks to upper middle and lower middle positions and preheat oven to 400°F. Drain sweet potatoes and transfer to large bowl. Toss with 3 tablespoons olive oil and season to taste with salt and pepper. Spread sweet potatoes on two rimmed baking sheets and roast until bottom side is browned, about 30 minutes. Carefully flip potatoes with thin offset spatula and roast until second side is browned and potatoes are tender, about 20 minutes longer. Transfer to a large bowl. Toss with remaining 3 tablespoons olive oil, parsley, and honey (or maple syrup or agave nectar, if using). Serve immediately. As a small way of saying thank you for your association with us over the past year, we have a special treat for you. 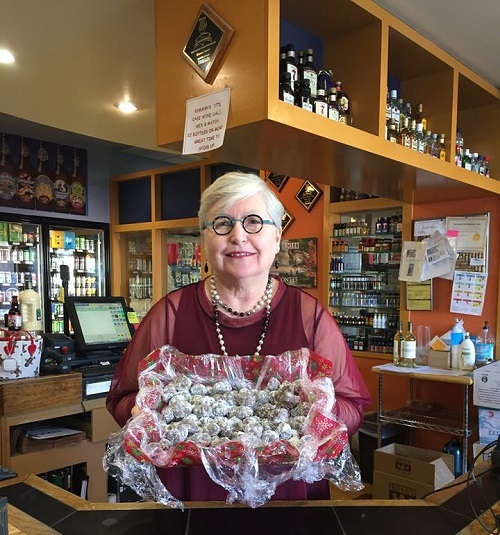 For over three decades, Mary Rimann has been baking special holiday snacks for all of our friends and customers who visit us on the first three Saturdays in December. Here is the schedule for this season; we don’t want you to miss out on your favorite. 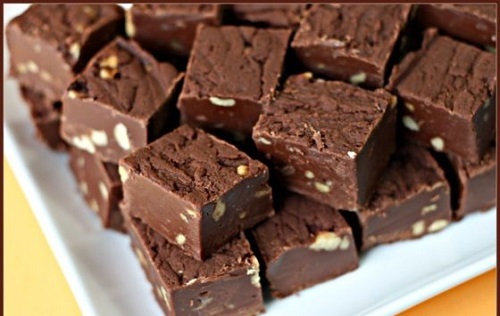 We are including Mary’s recipes so you can make and enjoy these treats at home. Happy Holidays from your friends at Rimann’s! Melt chocolate over hot water in a double broiler. Remove from heat. Stir in sugar and corn syrup. Blend in bourbon. In a separate bowl, combine crushed wafers and nuts. Add chocolate mixture to the wafers. Mix well and shape batter into 1-inch balls. NOTE: Batter is moister than in many recipes. If it is too moist, allow to set until firm. Roll balls in powdered sugar. Leave bourbon balls in covered containers several days to ripen. Makes 3 dozen. Line 8-inch square baking pan with foil. In a 2-quart saucepan, combine sugar, marshmallow crème, milk, butter, Kahlua and salt. Bring to rapid boil, stirring constantly for 5 minutes. Remove from heat: add all chocolate. Stir until melted. Add nuts and vanilla. Turn into prepared pan. Refrigerate until firm. To serve, cut in squares. Makes about 2 ¾ lbs. Cream together all the ingredients for the cookie base and spread over the bottom of a greased and floured 13 X 9 X 2 inch pan. Bake @ 350 degrees for 10-12 minutes. Meanwhile, beat the eggs in a small bowl. Beat in Kahlua and brown sugar until fluffy. Resift flour with baking powder and salt. Stir into Kahlua mixture. Fold in coconut and nuts. Pour over the partly baked crust. Return to oven and bake 20 minutes longer, until top is set. Remove from oven and cool. Cut into bars. Makes 24 bars.